Actors need never again be confused about where to begin or how to follow through when developing a Shakespearean role! Clear stepping stones have been laid out before them... by Shakespeare himself! Even seasoned actors familiar with verse are fascinated when they learn about the acting clues and stage directions embedded in the original text of Shakespeare’s work, in the form of particular punctuation, capitalized letters and spelling. Putting actors on their feet in dynamic and fun rehearsals, this practical guide helps develop the “seven Cs” of acting — commitment, concentration, conditioning, control, confidence, courage and clarity — while also demystifying how to perform these magnificently crafted plays. 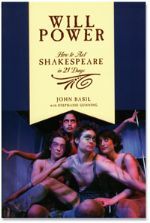 Read more...Will Power guides both student and professional actors through a lively 21-day rehearsal process leading up to the day of an actual audition or performance. High school, college and adult actors will find the 21-day sequence both fun and fulfilling as they move through the four phases of rehearsals: Secrets of Your Script Unfolded; Going On Instinct, Getting Off Book; Moments of Variety and Nuance; and Stanislavsky’s Approach.